A view of the hotel lobby from the upper balcony of the Fairmont Chateau Lake Louise in Banff National Park in Alberta, Canada. A first rate hotel where you can relax in lavish rooms, enjoy a day in the spa or dine in fabulous restaurants. 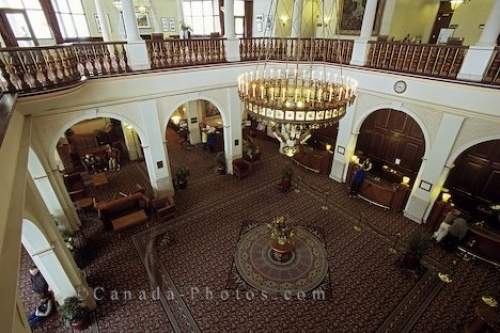 Picture of the hotel interior of the Fairmont Chateau at Lake Louise in Alberta, Canada.